More than a whodunnit, Sleuth is a who-done-what. A dramatic study of the sexual conflict between an older and a younger man as they pit their wits over the love of an undeserving woman. 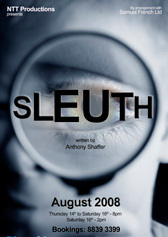 Part comedy, part thriller, part psychological drama, Sleuth takes the classic whodunnit genre and gives it an extra twist.